If you are thinking of a career in real estate, you want to work at Keller Williams Realty, a company that has reported record growth, productivity and profitability. There is a reason for this record growth. 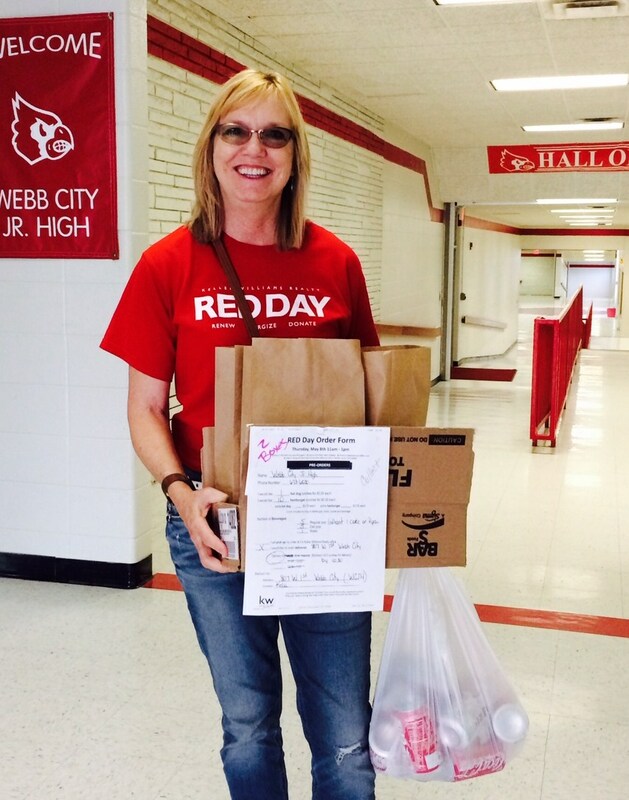 Keller Williams is a company that believes in giving back. Each year in May, there is Red Day. This is a day set aside to focus a need in the community. Last year in Joplin, our office worked to raise money and remodel Lafayette House, a local domestic women’s shelter. Keller Williams also gives back to its agents through profit sharing. This s a program in which a percent of every market center’s profits every month is returned to agents who have contributed by bringing other productive agents to the office. It is great to work for a company with such a great philosophy. Does this sound like something you would like to explore? I would be happy to talk to you about this, just give me a call. St. Mary Church in Joplin, MO was destroyed in the May 2011 tornado. We not only lost our place of worship, but also many of the artifacts that went along with making the church our home. But fortunately, someone found the quilt that had hung in the church vestibule. 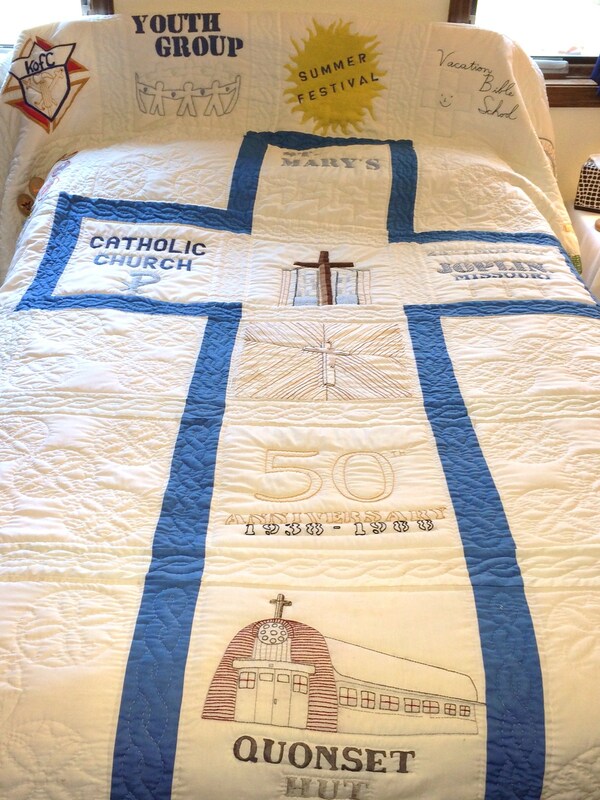 This quilt was completed by a ladies of the parish in 1988 to commemorate the 50th anniversary of St. Mary’s Church. The ladies did lots of work to quilt together embroidered squares that symbolized the different activities going on in the church at that time. Entering the church, all could enjoy the hard work of these ladies while thinking fondly of the fellowship our church offered. My kids always thought there should be a square for their favorite thing, the donuts we had after masses. The tornado left the quilt a bit of a mess. It was dirty and ragged. It was taken to St. Peter’s Church in Joplin by Susan Howell. 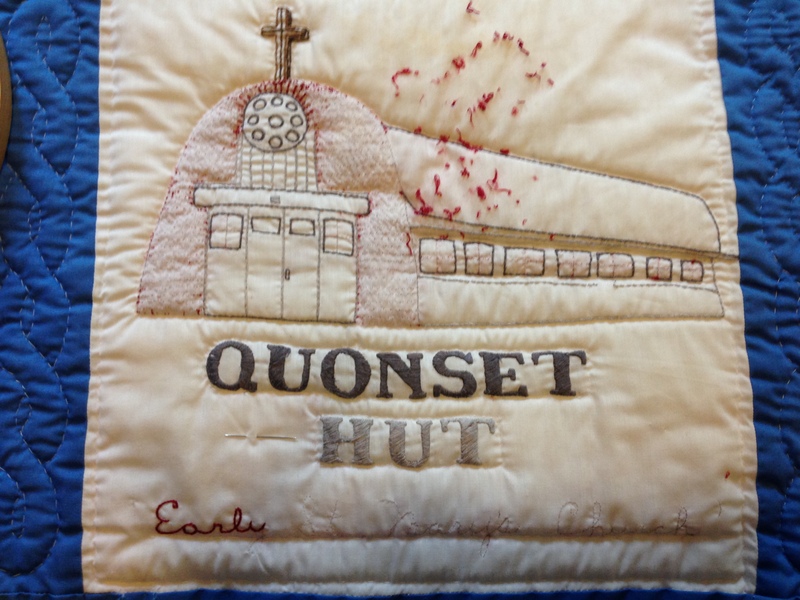 This quilt was dear to Susan because it was her son who made the frame for the quilt as his Eagle Project. 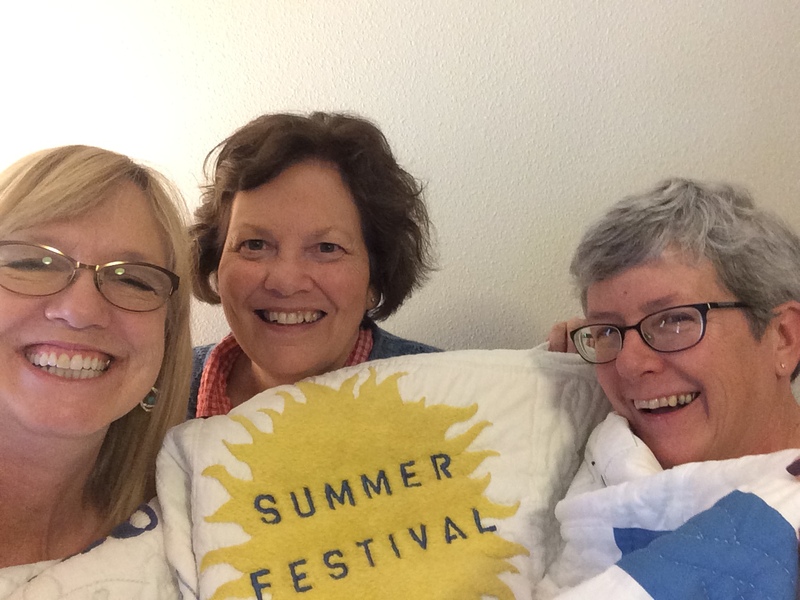 When Chris Perrey discovered that the quilt had survived and was at St. Peter’s, she asked if she could have it to repair. The quilt was a bit beat up from the tornado. Much of the embroidery was gone. And it was ripped in a few places. Chris began working on it but wanted to get it back in shape for the opening of the new St. Mary’s Church. The church is scheduled to open at its new location on December 17. That is when Chris asked me if I could do needlepoint. It had been a while since I had picked up embroidery thread, but I was willing to give it a try. 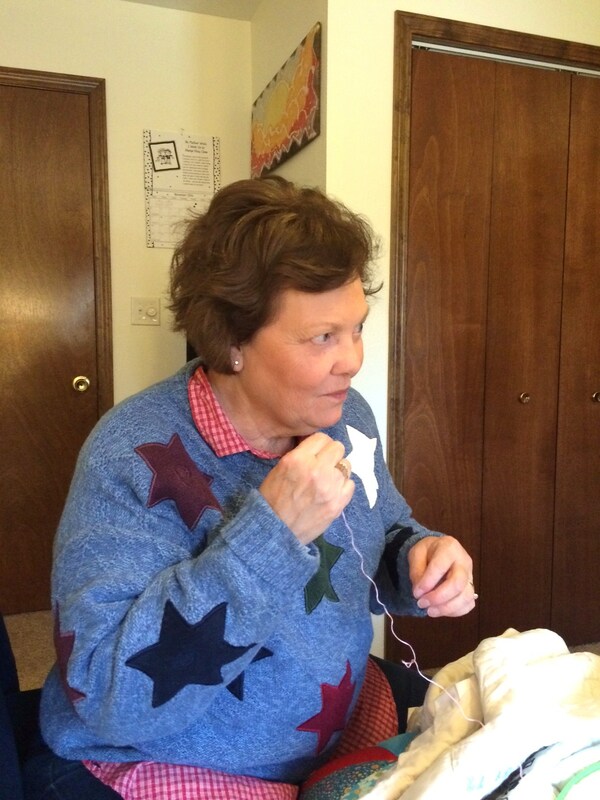 Then Sheri Kinler joined us to help get the work done. 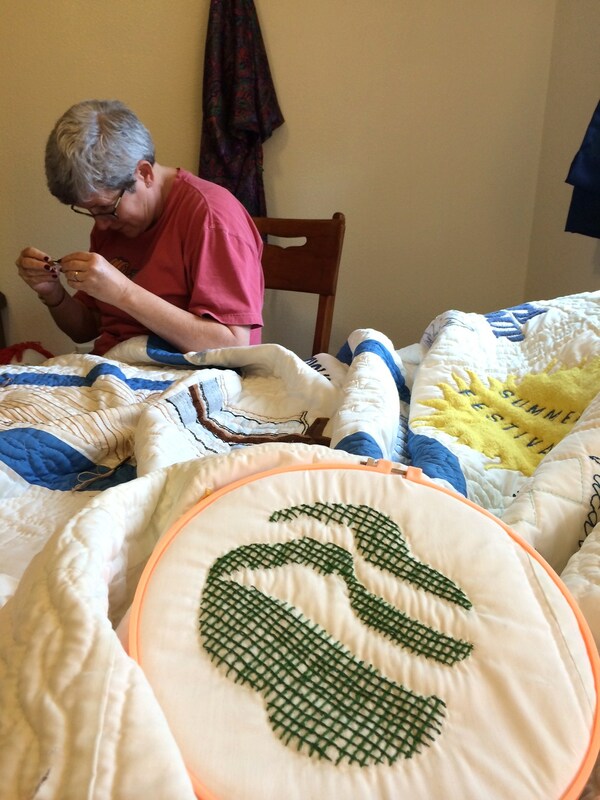 As we worked on repairing the quilt we thought of all the ladies who had originally worked on the quilt. I hope they had as much fun making it as we did repairing it. We also thought all the memories we had of our old church, all the different types of fellowships that the squares represented. Good New! 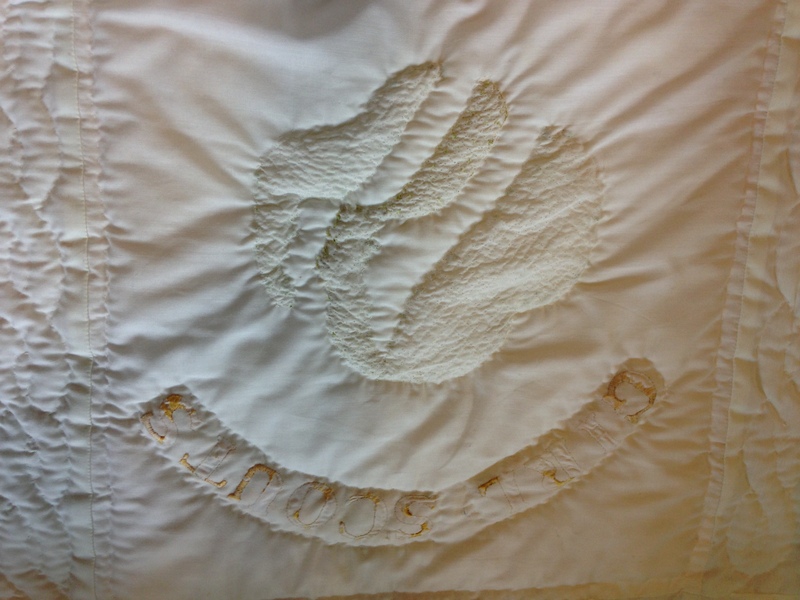 Today we finished the embroidery work on the quilt. We hope that in the new church there will be a spot for this dear friend of ours.